Summary: Son of Rambow is just lovely; sweet, very funny, feel-good entertainment, with first class performances by its two pint sized leads. 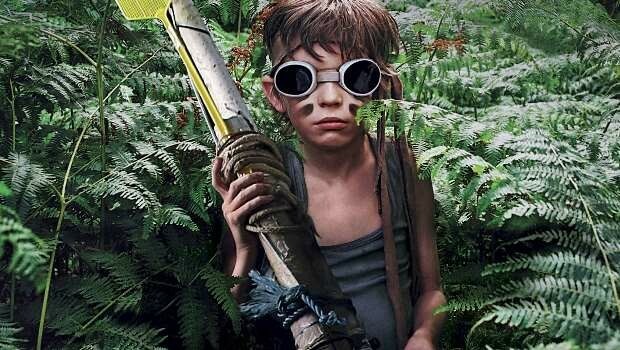 Son of Rambow is quite possibly the cutest film I’ve ever seen in my life. Garth Jennings follow-up to The Hitchhiker’s Guide To The Galaxy is a delight from beginning to end. Sensitive and lonely, 10 year old Will Proudfoot (Miner) has had a sheltered upbringing, as a member of a strict religious sect that bans television, music, films, and excitement. But one fateful day, sent out of the classroom in order not to be exposed to the corrupting influence of a documentary film, Will meets Lee Carter (Poulter), terror of the school and budding film maker. The two boys could not be more different, but when Lee shows Will a pirate copy of First Blood, Will’s world is rocked and his stunted imagination flowers. Lee Carter persuades him to be his stuntman in the film that he is making for the Children’s Film Foundation Screen Test competition. And so the two boys, with complete disregard for the consequences, start to make their film, with Will happily being fired through the air, shot at with a crossbow, and nearly drowned. His widowed mother (Hynes) notices the change in him, as do other members of The Brethren. But Will has a friend for the first time in his life, and even becomes popular at school as he and Lee make a name for themselves and kids queue up to be cast as extras. But when super-cool rock star-esque French exchange student, Didier Revol, descends on their film set, Lee and Will’s friendship – and their filmmaking partnership – is tested to the limit. Son of Rambow is just lovely; sweet, very funny, feel-good entertainment, with first class performances by its two pint sized leads. Will Poulter, especially, is a born comic with a wicked little face, perfectly reflecting, his casual cruelty to Will. Their guerrilla film-making adventures are hilarious; Lee Carter, like all the best directors, lets nothing come between him and a shot, dressed as Colonel Sam Trautman, improvising a clapperboard with his fingers. Garth Jennings’ observes the world of the 1980s with searing but affectionate accuracy. Cinemas full of smokers. A sixth-form common room that’s more like a school disco, with drunk kids rushing out to throw up. A giant car phone. And the freedom that modern children seem to be denied – an innocence despite their worldliness. Lee Carter, for all his toughness, is another lonely little boy, who if anything needs Will more than Will needs him. A bully himself, he is bullied himself by his older brother, who is all he has. In true Hammer & Tongs style, Jennings mixes animation and live action to great effect. It’s simple really – Son of Rambow is a gem.